It’s so simple, and so useful! Look at your piece of flat knitting, still on the needles. Now try to join the two sides of it so you have a tube. Hmm, it doesn’t quite work, does it? It’s easier to do when you’re in the middle of a row, though. Then you have an equal number of stitches on both needles, and the knitting easily folds into a tube. What you need is a curved needle, or perhaps a series of needles you can distribute the stitches across. This will allow you to join up the sides of your knitting and knit in the round! If you want a general overview, you might like to watch this video on knitting in the round. Most knitted garments are basically tubes – Armwarmers, legwarmers, the bodies of pullovers, sleeves, slipovers, skirts… Socks, mittens, and hats are tubes sewn up at one end. Avoid seams – Seams break up the continuity of your knitting, especially if you’re working in an intricate pattern. In certain cases seams can also be uncomfortable or bulky. Avoid seaming – Seaming can be tricky. Actually, it can be trickier than the knitting itself and many knitters dread it and put it off, some even pay others to do it for them! I wouldn’t recommend developing such a strong aversion to seams, but avoiding them saves you time and hassle. Why knit clothing in the round? The single best, most convenient, super thing about knitting a jumper (sweater) in the round is that you can try it on as you knit. For example, if you knit a jumper in 4 sections – back, front, and 2 sleeves – there’s no way you can be really certain of how it will fit until you seam it all up. That means you have 2 side seams, 2 sleeve seams, 2 shoulder seams, and possibly a neckband, or edging to sew on. This might take you hours, and if, at the end of all this work, you find you’ve made the back a few rows shorter than the front, or your sleeve shaping is a little awry, you will need to rip your seaming out, and then unravel and reknit. If you knit the jumper in the round, however, you can try it on frequently as you go, and see and correct problems immediately. There’s also no need to match up the front and back of garments. It’s a hassle to have to count rows when you’re knitting, but it’s necessary if you want the back of your piece to be the same length as the front. If you work in the round, you don’t need to think about this! You can watch your film, or read your book, or talk to your friend and not worry about losing your count. Circular needles are pairs of knitting needles that are joined by a bendy cord that allows for the knitting to be bent into a tube. They come in all the sizes that regular knitting needles are available in, but they are also available in different cord lengths. They’re better suited to wider-circumference circular knitting, such as sweaters and circular shawls. They are also ideal for larger flat knitting projects because you can fit lots more stitches onto them, and you don’t have to support the whole weight of the project with your hands. Double-pointed needles are just what the name implies; needles that have a point at either end. DPNs come in packs of 4 or 5 and are best suited to smaller-circumference circular knitting projects, such as socks, mittens, armwarmers, and small doilies. Knitting with double-pointed needles can be a bit slower, because of the need to switch out needles. They also need to be stored with greater so that the stitches do not slide off the ends of the needles. Stitches can be distributed across as many DPNs as desired, but the usual number is 3 to 4. If many more are required to achieve the right circumference for a project, it will probably be easier to use circular needles. Hats can be knit on DPNs or circular needles, according to preference. I like knitting them on 40cm/16in circular needles. If your circular needle is too long, the stitches will be stretched, and it will be difficult to knit them. There are techniques such as Magic Loop, or knitting on two circular needles that solve this problem, and you can watch the tutorials for them at KnittingHelp, but to begin with you will probably want to master how to knit normally in the round. I find 60cm/24in-long circular needles are most useful for jumpers (sweaters) knit in the round. However, this will depend on the usual size of your garments. If you knit sweaters that are usually over 80cm/32in around, then an 80cm/32in length will be more useful for you. 40cm/16in-long circular needles are usually the right size for hats. You need to keep in mind, however, that for the narrow section of the hat, you will probably need to revert to DPNs (Double Pointed Needles). Double Pointed Needles allow some flexibility in length, since your knitting doesn’t cover the whole needle. You will nevertheless find a variety of DPN lengths. Longer lengths can be used for knitting hats, and shorter lengths are usually employed for narrower items such as gloves or socks. Some sets come with 5 needles and some with 4. It’s always helpful to have 5 needles, in case you need to knit something with a wider circumference, or you need to work some instructions that require you to leave a number of stitches on the needle while you work with other stitches. Distributing your work across 5 needles also relaxes some of the pressure at the points where the needles meet, so if you’re having problems with ladders, this could be a solution. If you can’t find a set with 5 needles, you can buy two sets of four, OR you can usually use one DPN that is one size larger or smaller. The tension from a single odd-sized DPN should even out and be unnoticeable in the final product. 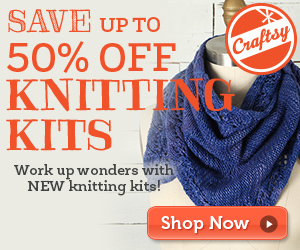 If you’re just getting started with circular knitting, just go with your usual cast-on. It’ll save you trying to learn two things at once. As a general rule of thumb, you can use the same cast-ons for circular knitting as you do for knitting flat. So for example, circular ribbing will benefit from a flexible cast-on like long-tail, and circular lace will look good with a stretchy, invisible cast-on. The only different will be that you will need to distribute your stitches across DPNs, or the length of a cable. Certain cast-ons, such as the backwards loop cast-on, make it particularly difficult to knit on a circular needle because they don’t keep their shape & size when they rest on the cable, therefore making it hard to slide them back onto the needles to work. For this reason elongated stitches are also impossible to knit on circular needles. If you want to neaten the cast-on join, read this post on tidier knitting. Have a look at this vintage pattern for a ‘Fatigue Cap’. It’s actually just a long tube of stocking stitch, seamed at both ends. This was a useful war-time pattern because it could be used as a scarf, or folded up to be a hat. This would probably be best in 4 ply yarn, since it might be rather thick when folded up. Once you can work a simple ribbing in the round, you can knit a tube of ribbing wide enough to go around your arms to make armwarmers, or around your legs to make legwarmers. Bodywarmers are wider tubes that you wear around your hips for extra warmth. Most people knit on the side of the tube closest to them, rather than the further side. If you find yourself knitting on the further needles, and you notice that the purl bumps are on the outside of the knitting (in stocking stitch), you’re probably knitting inside out. Don’t worry! I found myself doing this when I first tried circular knitting, and it took me a while to realise that I was doing things differently. It’s not a problem if this feels more natural to you; some people prefer to knit this way, and the results are the same! Some projects require you to turn your circular knitting inside out, and continue knitting on what is effectively the wrong side. Folded cuffs are probably where you will encounter this technique most frequently. Knit to the point specified, push your knitting through the middle of your needles, thereby turning it inside out. Make sure your yarn isn’t trapped awkwardly in the tube. Hold the needle with the yarn in your left hand, bring your yarn to the back (if you’re making a knit stitch), and with your empty DPN, or the other end of your circular needle, continue knitting as normal. There will be a small gap where you begin knitting, because turning your knitting inside out involves a change in direction. If your pattern doesn’t include instructions on how to deal with this, you could pick up one or two stitches in the gap (either before you begin knitting the first round, or after), and decrease them back to the original number on the next round(s). Make sure this doesn’t interfere with any patterning you might be instructed to do. If you find this too complicated, you could always leave the gap until the end, and sew it up carefully when you’re weaving in your ends. Round 2: Purl all sts. Purl all sts on every round. *K1, P1, rep. from * on every round. *K2, P2, rep. from * on every round. Ribbing in the round follows the same principle as knitting ribbing flat, you just work the stitches as they come, knitting the knit stitches, and purling the purl stitches. Once you get the knack of knitting in the round, you can progress to larger projects such as sweaters. You can knit an entire sweater or slipover in the round! You can also try some cabling, lace, and colourwork in the round. It’s easy enough to place a stitch marker at the beginning of the round if you’re working on circular needles, but I usually make sure I knit one or two stitches from the beginning of the next round if I’m going to put my knitting down at the end of a round, so the stitch marker doesn’t slide off. If you’re working on DPNs, place your stitch marker one stitch into the round, so it doesn’t keep slipping off your needle. Just remember that your round starts one stitch before the stitch marker. You won’t be able to use a traditional row counter when knitting in the round, because they’re designed to slide onto the end of straight needles. Instead, you can purchase counters attached to stitch markers, or make do with slipping one onto a safety pin, and slipping the safety pin onto your knitting needle. Rows (rounds) are counted exactly the same in circular knitting as they are in flat knitting. Lay your knitting out flat and count the “v”s of knit stitches, or the bumps of the purls. If you get the feeling your row count is too high (i.e. you have more rows than you’d expect), you’re probably right. Because circular knitting is only worked on one side, the stitches often appear shorter. This is why you should always swatch in the round for circular projects. Your gauge in flat knitting is unlikely to match your gauge in circular knitting. Switching from knitting in the round to knitting flat is as simple as… purling back! Just turn your knitting so that you can see the purl bumps, and the working yarn is attached to the left-hand needle, and using your empty DPN or the other end of your circular needle, begin to purl. If you aren’t working in stocking stitch, or your instructions state something other than purling, then do that. 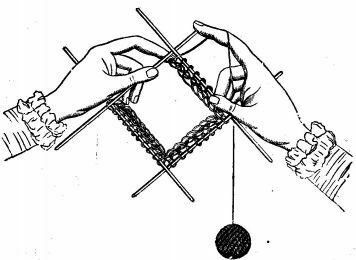 Once you get to the end of the round, turn your knitting around once more so that the right side faces you, and knit back. You should now have a distinctive “break” to your tube. To join your knitting into a tube once again, you need to work to the end of a RS row. Then instead of turning around, jump to the next needle and continue your circular knitting as before. You may notice some sloppiness at the corners where you switch between flat and circular knitting, in which case I recommend you take a look at this post on neater knitting. Also keep in mind that your gauge in flat knitting may not match your gauge in circular knitting, and this will be visible on scrutiny. You can offset this by experimenting with different needle sizes. Depending on your project (and your bravery), you may also be able to use steeks instead. A common problem when knitting with double-pointed needles is “ladders” that form between the end stitches on each needle; not because they were dropped (though this can be a problem too), but because they’re knit too loosely. One way to remedy this is to simply knit them as tight as you can. Another tip which would work well for stocking stitch is, instead of stopping knitting at the end of the needle and switching to the empty needle, knit 3 stitches from the next needle before you switch. This means that you’re shifting the gap between the needles 3 stitches every round, so the (potentially) loose stitches will be distributed and won’t ladder. Make sure you use a stitch marker to keep track of the beginning of the round though. Sometimes a pattern will advise you on how to distribute stitches across double-pointed needles, sometimes not. You don’t need to worry too much about this, just make sure there are roughly the same number of stitches on each needle, so that the piece can easily form a tube, and isn’t being stretched flat on any one side. If you’re working a complicated stitch pattern, it may be helpful to you not to break up pattern repeats between needles. If you can’t figure out where the pattern repeat is, just start knitting and you will begin to realise which stitches would be better off being on the same needle (if decrease stitches keep ending up on separate needles, for example). Also watch out for those yarn overs at the ends of needles; they can be easy to drop! When knitting in the round, increases and decreases can only be performed on the right side of the work. Other than this restriction, any increase or decrease technique that is used in flat knitting can be employed in circular knitting. For increases or decreases that are worked “on every right-side row” in flat knitting, an extra round can be substituted instead of the wrong-side row in circular knitting. When knitting with DPNs, it’s often easier to cast on all your stitches on one needle, then distribute them across the other three or four. When knitting ribbing in the round, you want to make sure you cast on the right number of stitches so that if you begin with a knit stitch, you end with a purl stitch. The trick to this is to cast on a multiple of the total number of your knit and purl stitches. So if you’re working a 1×1 (knit 1, purl 1) rib, your total number of stitches should be divisible by two. A 2×2 (knit 2, purl 2) rib will require a total number of stitches divisible by 4, a 3×1 (knit 3, purl 1) rib, also 4, and so on. A common problem when knitting in the round (with circulars) is that your knitting feels too tight, and you have trouble pushing them around the circumference of the needle. This is caused by using circular needles that are too short. It will affect your gauge and make life difficult, so as much as possible you should try to use the right length of needle (see above). Any more questions? Please direct them here.